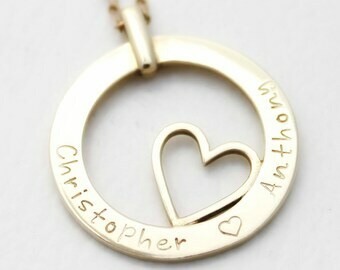 Hand stamped jewellery in silver and solid gold. Find us at markets around Newcastle, Port Stephens, Central Coast and Hunter Valley. Mrs Fickle's products are all completely made from Sterling Silver or 9ct/14ct yellow or rose gold. We DO NOT use any plated or filled materials or components as the plating can deteriorate with wear. The majority of Mrs Fickle pieces are made in Australia, exclusively for Mrs Fickle. We like to keep quality high and support Australian business so buy our supplies here where possible. You can be assured you are receiving the finest quality Australian precious metals. Mrs Fickle pieces are also thick, they range from 1.5mm thick to 4mm thick so you can be confident you are getting a quality piece. 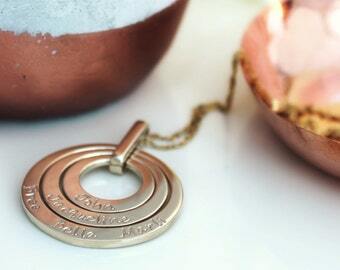 Each piece of hand stamped jewellery is unique. There may be slight variations in position and spacing of letters. We take great care with our stamping and will make sure the quality is very high but we also enjoy the unique look that hand stamping each letter provides, your piece will not look as if a machine made it, it will be beautiful and have character! Each Mrs Fickle order comes with a complimentary polishing pad to keep it looking it's best and arrives in a gift wallet. Please read all the information provided on your chosen design. There are measurements of each of the pieces to give you an idea of size, close up photographs can be deceiving so the measurements are there so you know exactly what you are getting. 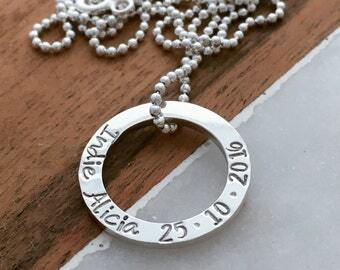 Be very specific about what you would like stamped and if you are using middle names please let us know as we may think you have twice as many children as you do otherwise! Double and triple check dates and spelling. Items will not be restamped free of charge if there was a mistake on your part. Mrs Fickle MAY add pictures of your items to her Facebook page. Please let us know if the item is a gift and you would prefer we don't upload the photo. Mrs Fickle will endeavour to have pieces posted within 3 weeks from payment being received. This is the worst case scenario. If you are needing something in time for a specific date please ask! Something can usually be arranged. All purchases are final. Returns will not be given unless a piece is faulty or there is a spelling mistake on our part. Items are sent via Australia Post with signature on delivery. Mrs Fickle is not responsible for items lost or damaged during transit. Overseas customers will be responsible for any customs charges they may incur.